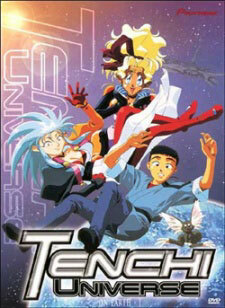 Watch Tenchi Universe Episode 26 English version online and free episodes. Anime Episode guide, Chapter Tenchi Universe Episode 26 English dubbed Payback Yugi has extended her crystal domain across the Earth, creating a dark and twisted reality that she plan to shape into the perfect world for her and Sasami to play together in. But when Sasami rejects her and joins the other girls at Tenchi’s side, a devastated Yugi withdraws to her throne room. With the girls acting as backup, Tenchi must find and confront Yugi- but exactly how should he deal with an entity who is both a malevolent demon and a scared and lonely child?